Intertops Poker and Juicy Stakes Casino frequently host online satellite tournaments that send winners to big money tournaments at casinos in Europe and the Caribbean. This month players will be competing for a seat at the €500,000 Malta Poker Festival. Starting tomorrow there will be four $3 Step 1 tournaments every day. The winner of each of those will advance to Step 2 where they can win a seat at the Final on September 16th. The champion will receive a $2500 prize package. 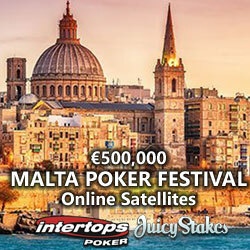 This month online poker players Intertops Poker and Juicy Stakes Casino will be competing for a seat at the €500,000 Malta Poker Festival. Starting tomorrow there will be four $3 Step 1 tournaments every day. The champion will receive a $2500 prize package and be on their way to Malta in November. With superbly sunny weather, attractive beaches, a thriving nightlife and 7000 years of intriguing history, Malta is an increasingly popular poker destination. The Malta Poker Festival is held at the Portamaso Casino, right in the heart of Malta’s vibrant night life. The $2500 prize package awarded to the winner of the Final includes buy-in to the Malta Poker Festival Main Event, Day 1C and $500 toward travel expenses. The winner will stay in a luxurious room at the Hilton November 2 – 7th and attend the exclusive MPF VIP party. Further information available at Intertops Poker and Juicy Stakes Casino .